Here is a little peripheral to cheer up a dull room. A bluetooth speaker that becomes a 3 in 1 entertainment system. Not only does the Bluetooth speaker pump out your funky beats, if puts on a light show with 16 million colors that pulsate with the beat. Add in an alarm clock function featuring a natural sunrise or sunset to gently wake-up or fall asleep to. Yantouch www.yantouch.com, winner of the Red Dot Award for their “Music + Light” consumer electronics designs, announced today that it is shipping the world’s first 3-in-l Bluetooth speaker, the Diamond+ Bluetooth speaker, with 300% Sound Boost and patented audio technologies; ambient wash wall light with 16 million colors that pulsates to the beat of the music; and a wake-up/sleep feature with natural sunrise and sunset lighting and music to gently and naturally fall asleep and wake-up. Great for camping and outdoor/indoor parties, the all-in-one entertainment system “instant party-in-a-box” features planetarium-like music and light modes for solid, bright, saturated, flashing, and alternating lights with 16 million variations of pink, purple, blue, fuchsia, orange, gold, green, white, and red. The light can be set up against a wall to create a wash wall effect or be placed in the center of the room or party as a conversational piece. The Diamond+’s Bluetooth speaker is an N-class 2.1 speaker system with patented sideways stereo effect with right and left woofer tubes on the sides of the device and other patented technologies, including Neodymium Super Magnet technologies and a Bass Resonant Tube that pumps up the bass with 300% sound boost for vibrant music that fills the party with booming crystal clear sound. The Natural Sleep feature works with the devices’ music and lighting system to emulate sunset to help you fall asleep naturally, gradually dimming the light and music. The Natural Wake-up function provides a sunrise effect to silently bring you from deep sleep to shallow sleep in 30 minutes, then wake you up slowly with natural birds singing. Distributed by Aplars www.aplars.com, a leading e-commerce store for electronic products and accessories and available immediately at Amazon at: http://www.amazon.com/Yantouch-BlackDiamond-Portable-Wireless-Bluetooth/dp/B00JFGIVWE and other online retailers, the Diamond+ is priced at only $149, 2-3 times lower priced than the $300-$450 it costs to buy each item separately: Bluetooth speaker, Smart Light and Natural Wake-up/Sleep device. World’s first 3-in-1 device: “Music+Light+Wake-Up,” with a market value over $300, priced at only $149. Best Music: World-leading N-class 2.1 speaker system with patented sideways stereo effect. And other Patent Pending Technologies: Spherical Resonant Neodymium speaker (3 Watts x 2), 300% Sound Boost and 2 Woofer Tubes: left & right with Bass Resonant Tube. 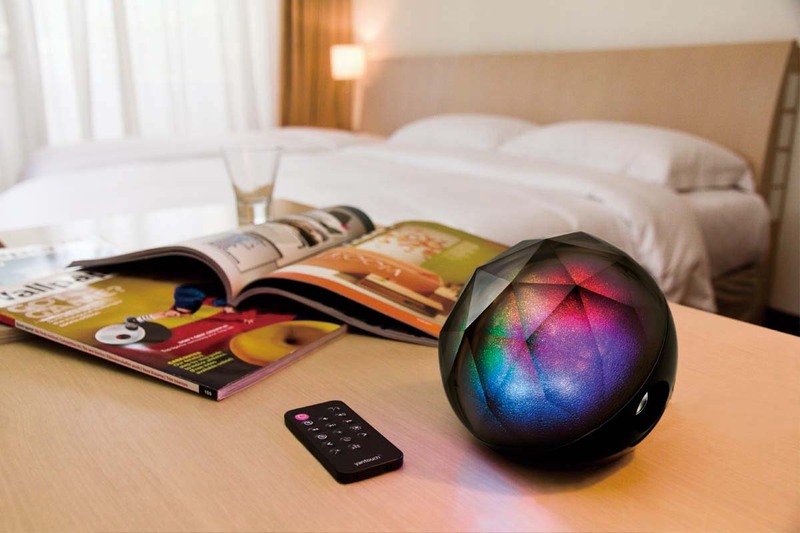 Smart Light: Includes 16 million beautiful colors to suit your mood, syncs light with your favorite music. Bedside Reading Light: functions as a bedside reading lamp before sleeping with soft white light (no heat with energy saving LEDs) while listening to your favorite music. Natural Sleep Feature: Includes iOS and Android App that emulates sunset to let you fall asleep naturally, gradually dimming light and music. Natural Wake-up Feature: Sunrise silently brings you from deep to shallow sleep in 30 minutes, than wakes you naturally. Bluetooth 3.0 Speaker: Features automatic Bluetooth pairing – unlike most Bluetooth speakers which are hard to pair. Connects over 30 feet (more than most competitors). Rechargeable Li-battery: lasts over 7 hours, great for outdoor parties with USB/AC power cable for charging and attached audio cable for use with non-Bluetooth devices and computers. Portable and light-weight: 2½ lb with dimensions: 13×11.9×12.8cm. Remote control: turns on/off, adjusts volume, tracks, and color modes with slot to store remote.